The village of Clodoch stands on the Munnow river near the Black Mountains and is roughtly 15 miles from Hereford. St. Clydog church dates from the 12th century, and is dedicated to St. Clydawg, King of Ewias who was martyred about 500AD over whose tomb the church was built. . It has a large 15th century tower which was not only used as a bell tower but also as a defence against the marauding Welsh. 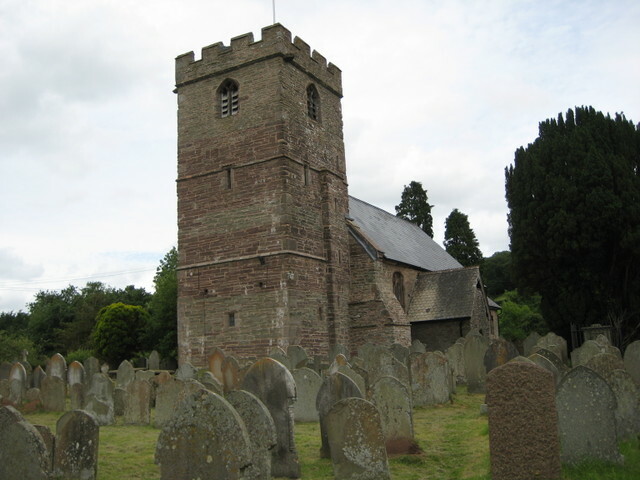 In 1919 the church was re-opened on 10th December by the Bishop of Hereford. The Bishop said that preserving churches such as this was of national importance as they stood as a witness of the centuries. There had been many previous restorations, starting with one during the Norman period and the 1919 restoration was long overdue as the church was in an appalling state, with half the seats broken and the flooring in a dangerous condition. Many of the windows were broken and the heating was non existent. A restoration fund was opened, and it was hoped that the work would come to no more than £1000, but the estimate was soon increased and the bells scheme had to be shelved altogether. However, although in 1919 some work still needed to be done, the congregation at the re-opening loved not only the beautiful setting, but also the old oak pews; the decker pulpit; the Jacobean communion table; the stone font; the ancient mural tablets and the deep set windows. This church boasts 9th century stone inscribed in Latin – “This tomb holds the remains of the faithful and dear wife of Guinnidas, who was herself a native of this place”. There is a 17th century three deck pulpit which dates from the 17th century and is believed to be one of the best in the country.